You are here: Home » Take a 100 Meal Journey this Nutrition Month! In case you hadn’t already heard, March is Nutrition Month! I know, I’m a week late to the bandwagon, but in my defence, I’ve been so busy with Nutrition Month promotion at work, I haven’t had the energy or motivation to sit down and write about it myself. What can I say, sometimes the paying gig needs to come first 😉 But always better late than never! 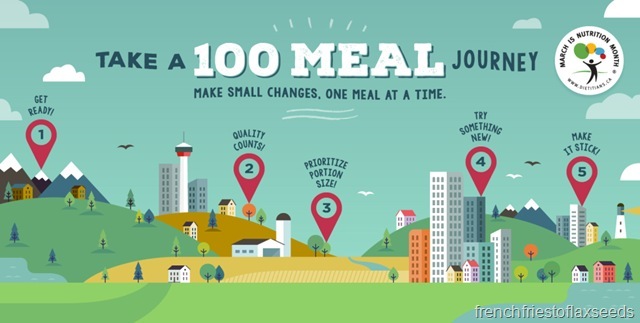 This year the theme for Nutrition Month is “Take a 100 Meal Journey – Make Small Changes One Meal at a Time”. Why a 100 meal journey, you ask? Well, we eat approximately 100 meals in a month, so this means we have many opportunities to practice making small, nourishing changes throughout the month of March. And that doesn’t even take into count snacking and beverages! Making changes to our eating patterns really is a journey – we don’t magically change our habits over night, and we aren’t always perfect in following through on our intentions. And that’s okay! If you look at each eating (or drinking) event as a opportunity to improve on your healthy living behaviours, it seems so much more manageable! Focusing on making only 1 or 2 small changes this month instead of a drastic overhaul to everything you eat and drink will set you up for success in the long term. If you can determine a few small changes you want to make, and stick with them throughout the month, you are more likely to keep them up past the end of March, and then maybe start to build on them with another change or two. Not to mention that those small changes have big impacts when you keep with them in the long term. I want to invite all of my readers to join myself and 3200+ of your fellow Canadians in taking the Nutrition Month Pledge! Decide on what small change you would like to make this month, and pledge to stick with it. I’m pledging to stick with the weekly meal plan I make for dinners. I always write up a plan of what we’ll have for dinner each night, but sometimes when I come home from a long day at work, it can be really easy to just say I’m too tired to make dinner, and either order something in or go out for dinner. So not only does that mean I’ll probably be eating a less nutritious meal, but it also means I’m spending more money, and maybe even wasting food if the items I was going to cook end up going bad because I don’t use them. In order to be successful, I’m going to try and keep weeknight meals simple, so they don’t seem to daunting to cook when I’ve had a long day. And I plan on relying on some of my tried and true recipes to keep me on track! 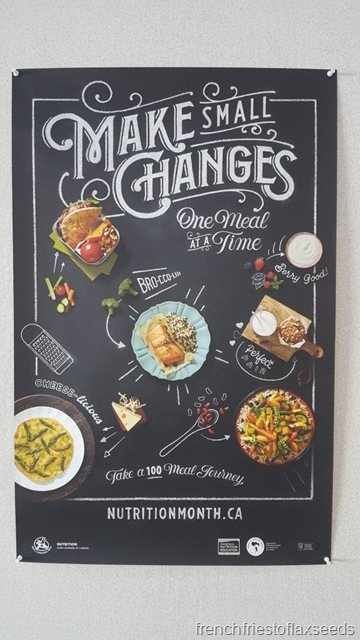 To keep on track with your small change, make sure to check out Dietitians of Canada’s Nutrition Month homepage, and follow them on Twitter and Instagram for tips and resources to help you in your 100 meal journey. I’ll be tweeting out lots of info as well! And share in the comments what small change you are pledging to make this Nutrition Month – I’d love to hear them!